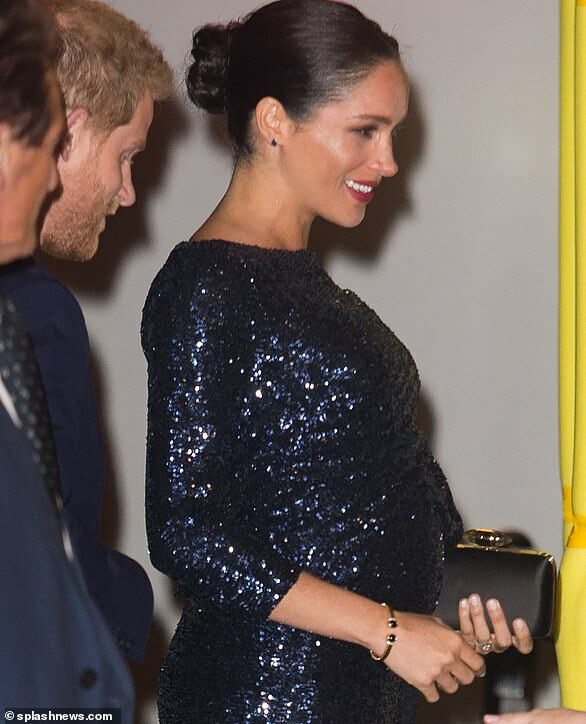 The Duchess of Sussex put on a dazzling display as she attended a Cirque De Soleil charity performance at London's Royal Albert Hall on Wednesday. And eagle-eyed fans soon noted that Meghan's ensemble appeared to have been inspired by the late Princess Diana, who would have been her mother-in-law. The pregnant duchess, 37, opted for a navy sparkling £3,400 floor-length dress by Roland Mouret, similar to the sea green gown by Catherine Walker first worn by Diana at the Burgtheater in Vienna in 1986, and then again to a charity ball at Osterley House in 1989, and the Diamond Ball in 1990. In a nod to Prince Harry's late mother, Meghan also wore one of Diana's bracelets - an elegant gold, open bangle with two dark stones, as she attended the event in aid of those affected by HIV in South Africa, a cause that was also close to Diana's heart.